Purchasing a private car for commuting short distances in a city can be a troublesome affair. You do not really need a car to travel to nearby places often, just get yourself an electric skateboard. Acton has come up with a brand new elegantly designed longboard that is a perfect solution to all of these problems. The Acton Blink S boasts of a powerful motor hub system, along with an impressive build design. Even though skateboarding is primarily a city dwellers’ hobby, Acton claims that their Blink S skateboard will perform excellently in rough terrain. 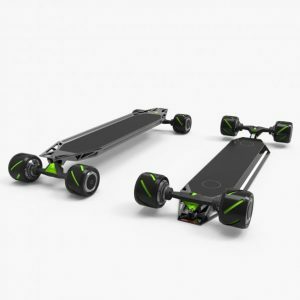 In addition to that, this longboard has 3 different ride modes to compensate for different terrain structures and control the speed in different rides. Despite its good performance in rough terrain, this skateboard remains a city dwellers’ best commuting option in the market. Is Acton Blink S Safe for Travel? Is Acton Blink S worth its Cost? Dimensions 27.7 inches x 8 inches. The most important aspect of Acton Blink S skateboard is its lightweight build construction. Its deck is made of Canadian maple wood, upon the framework of an aircraft grade aluminum body. This makes the skateboard extremely durable. Despite this sturdy construction, the whole board weighs only 10 lbs. Thus it can be easily carried by a 12 year old, even though it can sustain a maximum load of 230 lbs. Its deck size is quite comfortable to ride on. Along with that, Acton also incorporates a functional tail to the back end of this skateboard. It enables the rider to carve out sharp turns without toppling themselves on the board. A unique feature that strikes fellow skateboarder is the fact that this model has been designed in such a way that without any charge, it will function as an ordinary skateboard. Acton Blink S delivers a powerful performance with the help of its single hub motor system. This model consists of a 600 watt motor attached to the lower surface of the board. This setup enables the skateboard to have a much lower center of gravity than most boards, which results in better control and easy bending in curves. 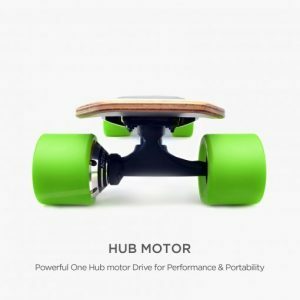 In addition to that single hub motor system, this skateboard has 80 Wh Lithium ion Samsung battery cells which are used to power the electric skateboard. This battery has a shelf life of 8 years, so they can be used for a long time. The charging time is just 45 minutes which is extremely fast when compared to similar products in its price range. 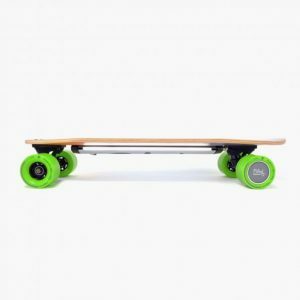 The construction of this skateboard is pretty sturdy and its 83 mm wheels improve the overall stability and maneuverability of this long board. Acton also provides integrated LED lights on its front and back. In addition to that, 2 side lights are also incorporated for better visibility while commuting. Due to its single hub motor system, Acton includes regenerative braking in this model. This ensures that your brakes are functional in regenerating electric power for the wheels. It also prevents toppling over when the skateboard comes to a sudden stop. Acton provides a 6-month warranty period for the skateboard and other in-box accessories. So, you can easily avail their service options free of charge within the warranty period. Acton Blink S is priced at $699 on their official website. Considering the fact that you might have come across several skateboards costing within $700, this is the cheapest and most effective among its competitors. Acton provides a dedicated app for both iOS and Android interface where you can join the skateboarding community in your area. It also keeps track of the distance travelled; battery used and ride modes information. Coupled with its excellent power motor, this board provides the most viable alternative to walking in the city at a very affordable cost. So, if you are tired of walking to work or school every day, what are you waiting for? Get yourself an Acton Blink S!